It’s important to follow the letter of the law when it comes to tax filing. We recommend you work with an experienced tax advisor to ensure you comply with the new law and benefit from any changes. If you could use a referral, please give us a call; we may be able to recommend tax professionals from our network. 1 Barnini Chakraborty. Fox News. Dec. 18, 2017. “GOP tax bill: Can you really file your taxes on a postcard?” http://www.foxnews.com/politics/2017/12/18/gop-tax-bill-can-really-file-your-taxes-on-postcard.html. Accessed Feb. 7, 2018. 2 The Tax Foundation. “Business Tax Compliance and Complexity.” https://taxfoundation.org/federal-tax/business-tax-compliance-complexity/. Accessed Jan. 23, 2018. 3 Adam Looney. Brookings. Dec. 14, 2017. “How the new tax bill encourages tax avoidance.” https://www.brookings.edu/blog/unpacked/2017/12/14/how-the-new-tax-bill-encourages-tax-avoidance/. Accessed Jan. 23, 2018. 4 Zoë Henry. Inc. Dec. 20, 2017. “The Tax Bill Is Final. Here’s What U.S. Businesses Need to Know.” https://www.inc.com/zoe-henry/final-tax-bill-impacts-businesses-2017.html. Accessed Feb. 7, 2018. 5 Lydia DePillis. CNN Money. Jan. 8, 2018. 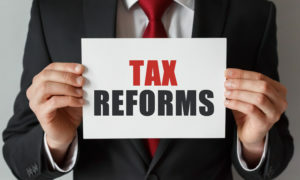 “How the federal tax overhaul could reshape state budgets.” http://money.cnn.com/2018/01/08/news/economy/state-budgets-tax-reform/index.html. Accessed Feb. 23, 2018. 6 WUSF News. Jan. 22, 2018. “Gillum Proposes Corporate Tax Increase.” http://wusfnews.wusf.usf.edu/post/gillum-proposes-corporate-tax-increase. Accessed Feb. 7, 2018. 7 Edmund DeMarche. Fox News. Jan. 21, 2018. “California Democrats want some businesses to fork over half tax-cut savings to state.” http://www.foxnews.com/politics/2018/01/22/california-democrats-want-some-businesses-to-fork-over-half-tax-cut-savings-to-state.html. Accessed Feb.7, 2018. 8 Tracy Samilton. Michigan Radio. Jan. 23, 2018. “Residential utility bills could go down 3% thanks to corporate tax cut.” http://michiganradio.org/post/residential-utility-bills-could-go-down-3-thanks-corporate-tax-cut. Accessed Jan. 23, 2018.